Why learn about debris clouds? Well, this cloud formation provides visual indication that a tornado is about to come. So learning about debris clouds is very important since it could save your life when a tornado comes. Debris clouds refer to the rotating cloud made up of debris and dust at the base of a tornado. This cloud formation is all you need to validate the existence of tornado even if there is no funnel cloud seen. More often, debris clouds appear below the condensation funnel cloud confirming its contact to the ground. When you see an advancing debris cloud, take cover immediately because tornado is just seconds away. A debris cloud develops due to tornado rotation beneath a funnel cloud which is trying to establish contact with the ground. As the column of wind vertically spins and narrows more violently in the supercell, the wall cloud rotates with it. A tornado develops on the right-rear side of a supercell where flow of cool air coming from the thunderstorm’s updraft rotates into the updraft of warm air. Sometimes, a funnel cloud is not visible when there is inadequate moisture. Even so, tornado is confirmed when you see a debris cloud forming on the ground. What Do Debris Clouds Look Like? The appearance of debris clouds depends on the type of dust and debris it gathers as well as the amount of moisture the funnel clouds contain. In most cases, debris clouds appear bluish-grey or even darker, taking on a cylindrical shape, twirling and mixing everything in its pathway. If the cloud is generated in red tinted soil, it will have a reddish color. At What Height is Debris Clouds Found? These clouds rarely extend over three hundred feet from the ground although it may reach up to 5,000 to 10,000 feet or more in cases of strong tornadoes. 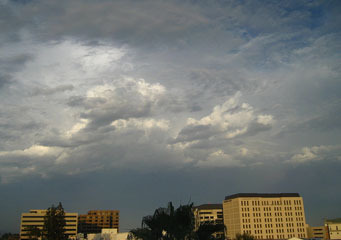 The vortices of debris clouds vary in size and force. They may range from a few meters to several hundreds of meters and may disappear instantly or last for several hours. How common are Debris Clouds? This cloud formation is common in tornado-prone regions such as the United States; although tornadoes occur anywhere on the globe. However, the United States tops the list of tornadic activity especially in Central Plains where unstable atmosphere and powerful wind shear result to tornadic development. In addition, tornadoes are very common in the summer time usually in the afternoons, the time of day when the atmosphere is very unstable due to surface heating from the sun. So when you notice debris clouds alongside funnel clouds, take cover because tornado will surely follow.